Stopover at Charter House Hotel prior to the group flight to Puerto Princesa the following morning. The balance of Thursday was devoted to Bike preparation and set-up, before the real business of the next 3 days. Both Indonesia and Mongolia entered four Riders apiece whilst for their first time entry, Iran entered two Riders. All others were single entries except for the host Nation who entered eight Riders including National Motocross Champion turned Road Racer Glen Aguilar. Japan’s Yamaha Rider Takeshi Tabuchi conducted a well-attended Rider school after general practice, with many young Riders eager to learn from his many years of race experience. 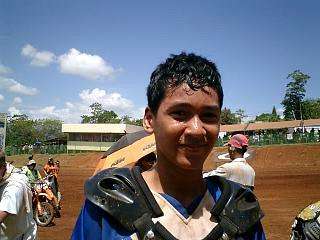 Indonesia’s Aldi Lazaroni qualified his Kawasaki KX250F fastest of the 125/250f Riders while Local Philippine Rider Lorenzo Rellosa was quickest on his Yamaha YZ85 in the Junior 85cc category. Directly after the Opening Ceremony, Asian Championship racing got under way with Moto 1 for the 12-U15yo 85cc youngsters programmed for 15min + 2 laps of the 1.2 Km Sta. Monica circuit. Indonesia’s Ivan Harry Nugroho was first out of the gate and held his advantage to the end of the uphill start straight where Paul Errol Angoco railed the RH berm and passed him. From there on it was Angoco’s race all the way as he continued to pull away from the other Riders but there was certainly close racing behind as Rellosa closed on Nugroho, then a touch and Rellosa was off the track and Nugroho was picking himself up to restart his Honda. By lap 6, Angoco held a 30sec lead over 2nd placed Rellosa, with 12yo Filipino Jean Erick Mitra in 3rd and fellow Filipino 13yo Patrick Orbe in 4th and fast charging Nugroho rounding out the top 5. Angoco lapped 12yo Renan Alquizola on lap 8 and the youngest Rider Rafael Enriquez on lap 10 before going on to take the Chequered flag on the 12th lap by a massive 41 sec from Rellosa, Orbe, Nugroho and Mitra in that order. 21 Riders entered the 125 Championship but only 20 fronted for Moto 1 due to a practice mishap by Filipino Jubenile Abellar. 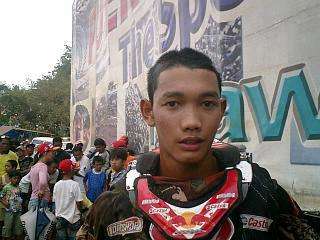 The gate dropped at 11.56am and the holeshot went to Kawasaki mounted Filipino Kenneth San Andres. Lap 1 positions - San Andres. Indonesia, Hermawan- KTM. Indonesia, Mulyadi- KTM. Philippines, Aguilar- KTM. Indonesia, Wiguna- Honda. Mongolia, Erdenebileg- Kawasaki. 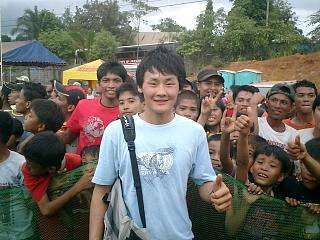 Thailand, Thangthong- Honda. San Andres held his lead for more than ¾ race distance before Muyadi passed him on the ninth lap. Mongolian Lhagvadorj- Kawasaki, was out on lap 2 and Indonesian Lazaroni barely made it to the service area with his Kawasaki cooked due to a dropped water hose. 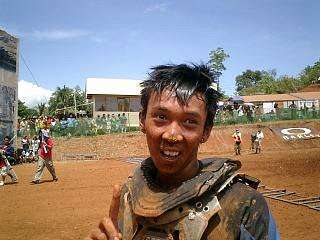 This was close exciting racing but at the end of the 20min +2 lap Moto 1, Top 5 places went to 1/ Dede Mulyadi. 2/ Glen Aguilar. 3/Alex Wiguna. 4/ Kenneth San Andres. 5/ Khaliunbold Erdenebileg. 85cc Moto 2 at 1.48pm and this time it was Errol all the way as his KTM powered away from the gate. Front positions remained unchanged for most of the race in the order of Errol, Harry, Patrick, Lorenzo, Erick, however it was rewarding to see the two youngest Filipino boys Rafael and Renan competing in their first ever Asian Championship. Errol’s win this time was by 25secs from Harry with Patrick, Lorenzo and Erick taking out the minor placings. * Errol giving Guam a first ever Event win. 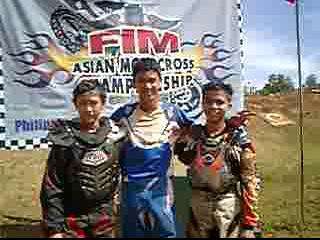 * Dede and Trakarn a Moto win to each although Dede took out the event win with a 1st and 2nd to Trakarn’s 6th and 1st.